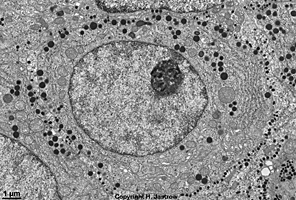 This electron microscopic atlas contains over 2,800 original digital images (>2.150 electron- & >700 light microscopic) of very high quality and very high resolution acquired from organs, tissues and cells of mammals and man. 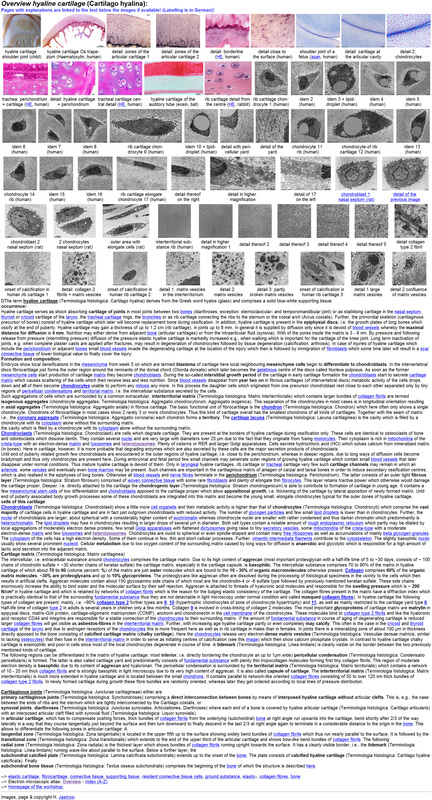 Explaining interlinked texts and over 250 images labelled in great detail as well as a vocabulary explain cellular structures in a generally intelligible form and show interrelations as well as correlations of structure and function. 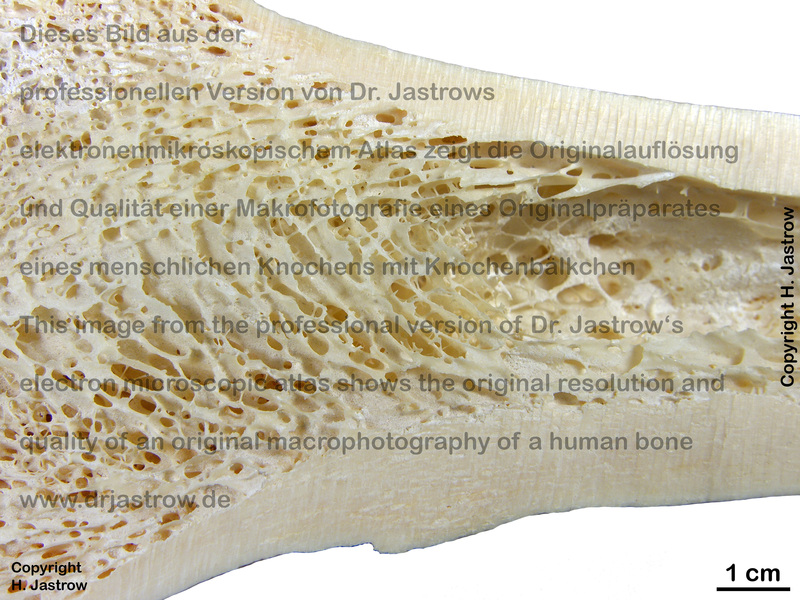 Please click on the images to see them in original resolution! 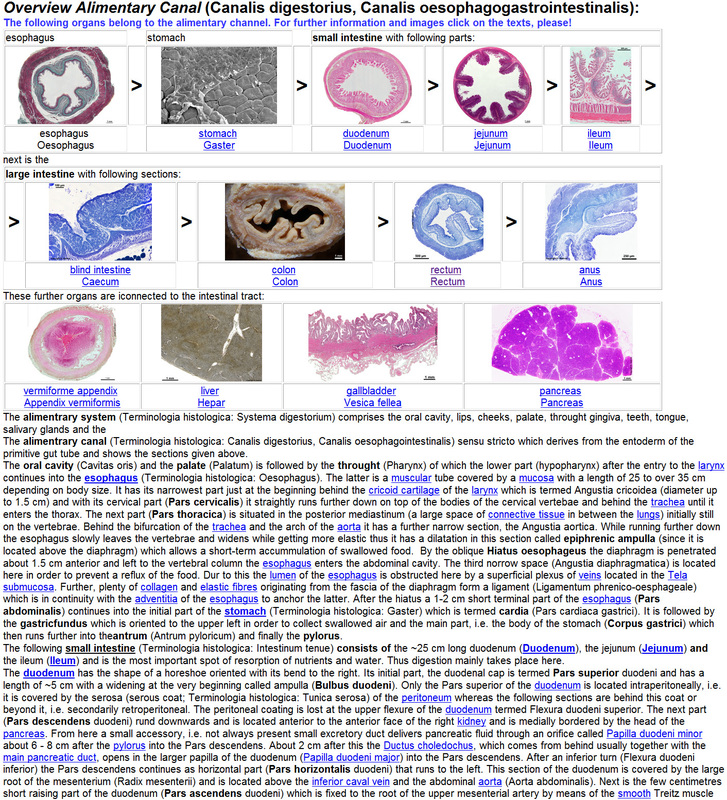 Anatomical basic (and special) knowledge is of major impact in basic and further education. 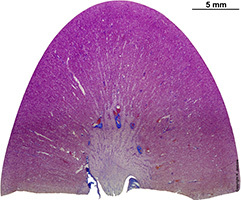 It is an important basis for understanding medicine, physiology, common and molecular cell biology, pathology, biochemistry, pharmacology and further disciplines of the biomedical instruction and research field. 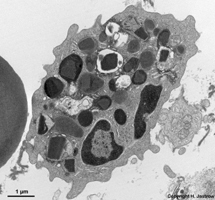 In this context a profound knowledge of cell and tissue ultrastructures (structures which are too small to be visible in the light microscope) is an excellent key to understand life processes and the reason of many diseases. 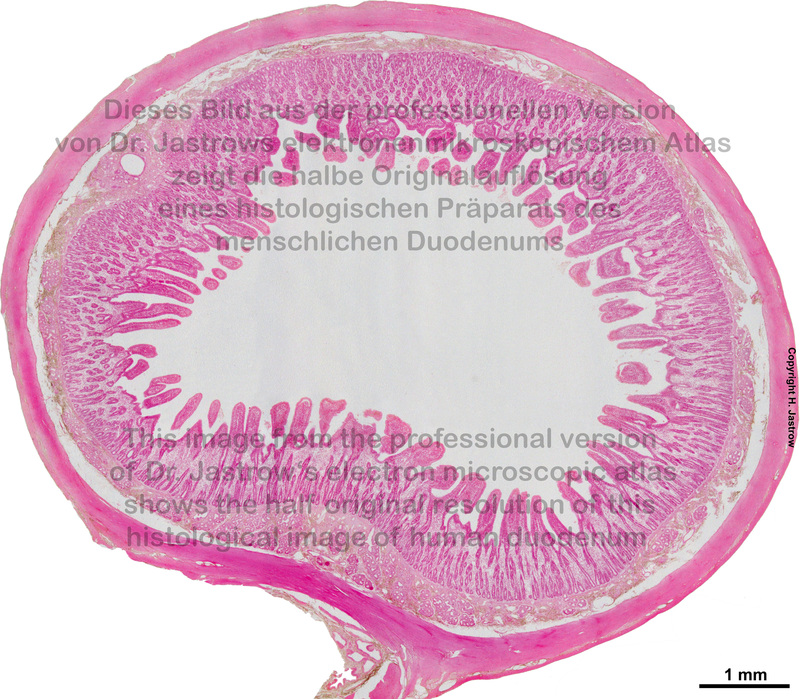 In this context original images of splendid quality and resolution showing real ultrastructures are essential. 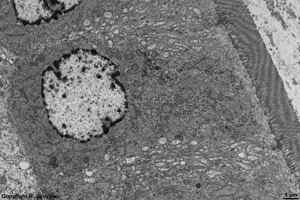 However there are few text books or other sources of images available which offer sufficiently detailed electron-micrographs in a number that allows to get a general overview. 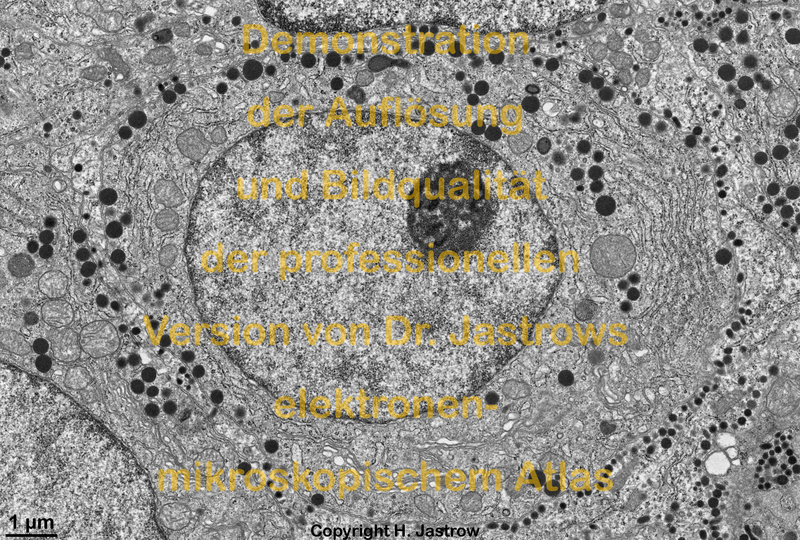 Dr. Jastrow's electron microscopic atlas gives realistic ideas of ultrastructures by means of over 2,150 large, high-quality digital transmission and some scanning electron microscopic original images. 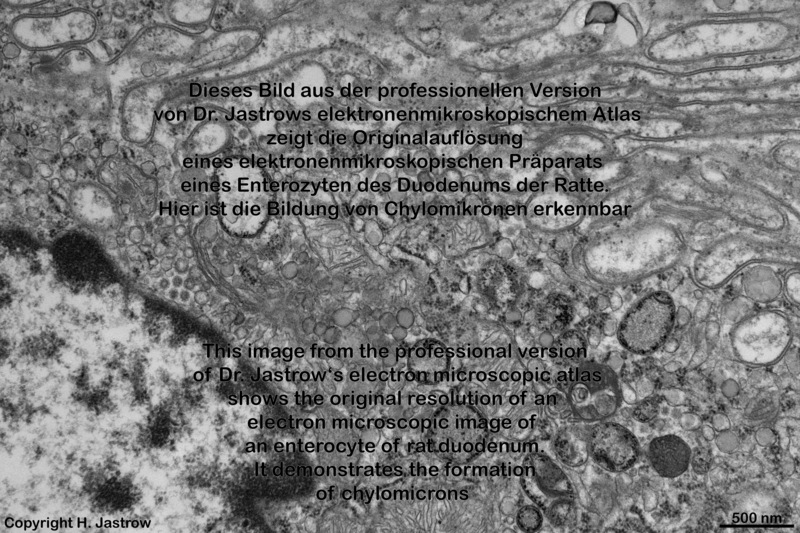 Further, macrophotographies of original preparations of many organs and over 700 light microscopic images in very high quality and resolution allow to zoom into organs from overview via light microscopy to fine electron microscopic detail (see below) The pretty complete image library of cells, tissues and organs was taken from preparations of man and/or mammals (monkey, rat, pig, mouse, guinea pig). 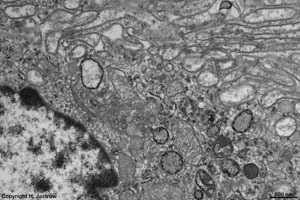 The majority of pictures are multiple image aligned digital micrographs acquired with a slow-scan CCD camera, others are high quality scanned original micrographs or inversely scanned plate-film negatives. 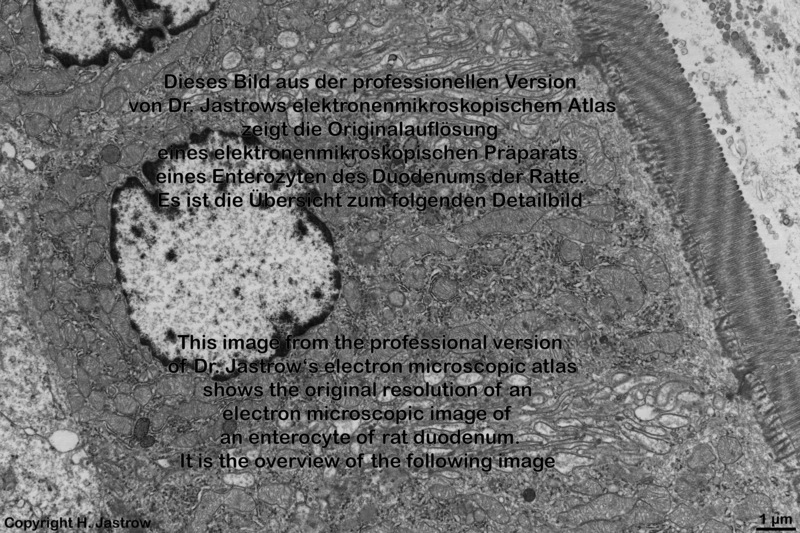 Artefacts were thoroughly removed and unequal illumination was corrected in most included images eventually additional sharpening was applied to offer best possible quality in the digital images which are stored as maximum quality encoded jpg files in the atlas. Choice of material is based on quality and relevance for instruction on colleges, high-schools and universities. 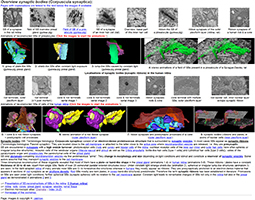 Since the resolution of the images is mostly superior to 2.000 x 3.000 pixels very considerably more details are visible in comparison to the internet version of the atlas. 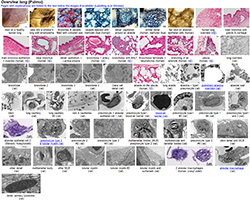 Every topic is covered by many different images generally from overviews in lower magnification to very high resolution detail pictures. 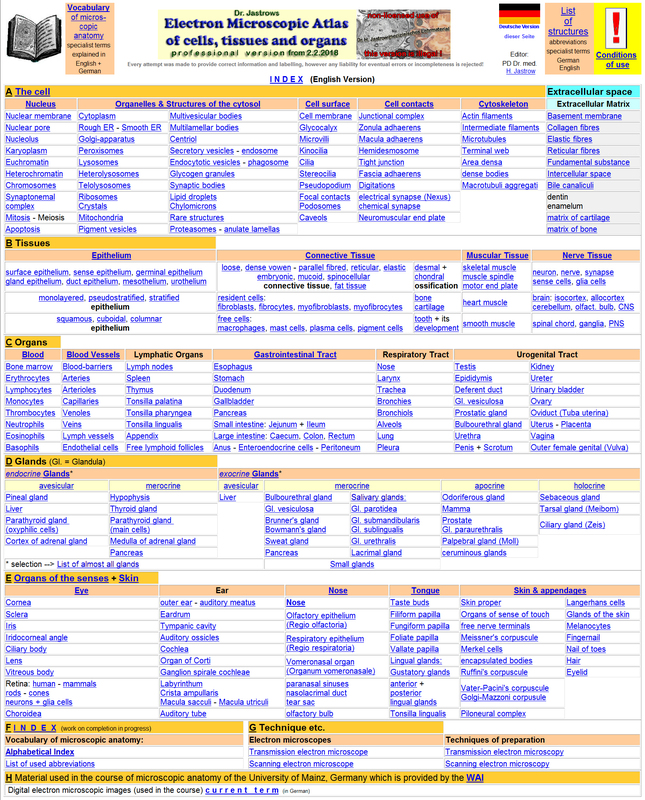 The start page (Fig.1) lists important key words which are ordered thematically. 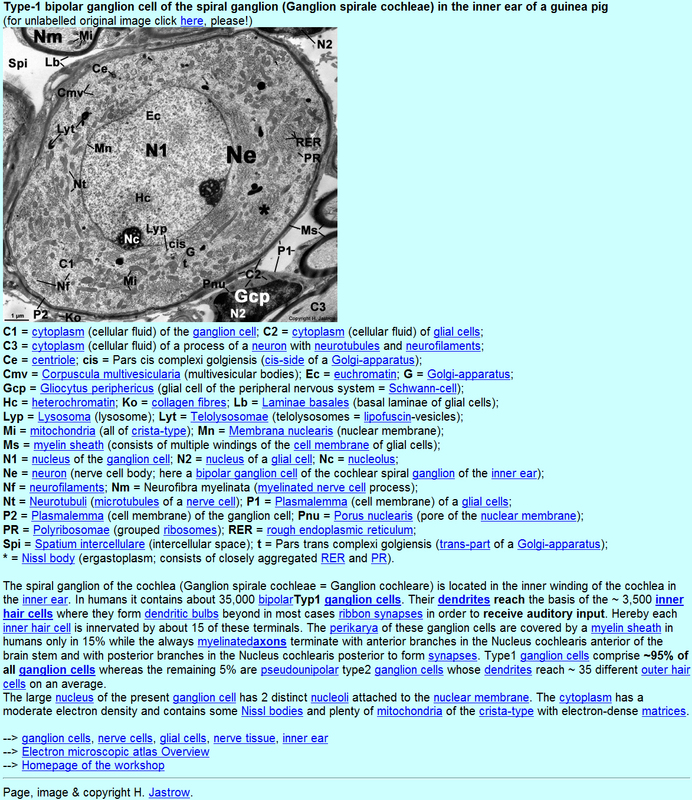 It shows an overview table of organelles, nuclear, cellular and extracellular structures, the 4 basic tissues, organs and organ systems. 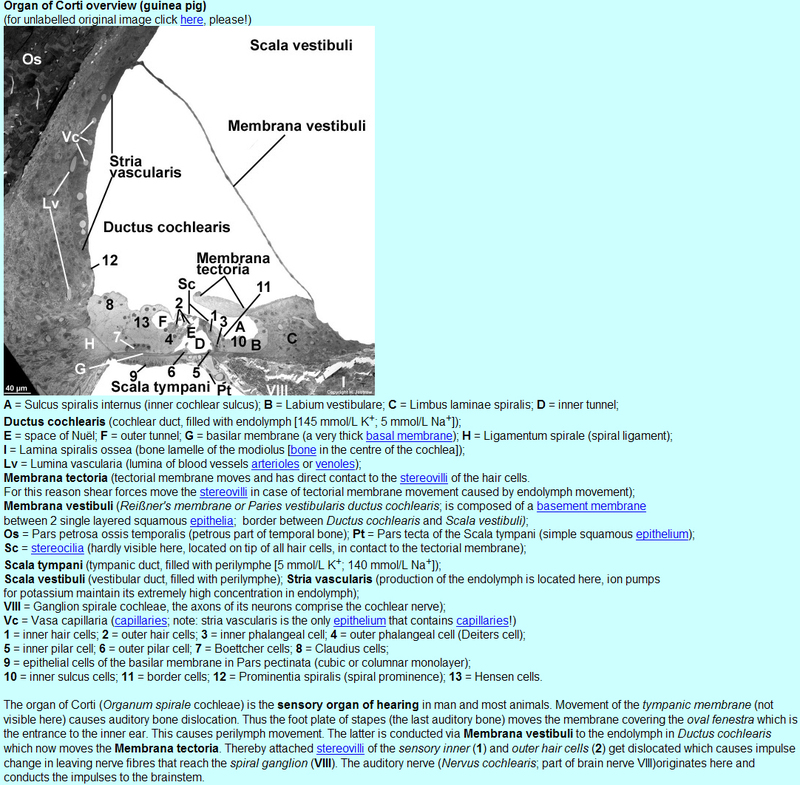 Pages providing information and image overviews are linked to the key words. 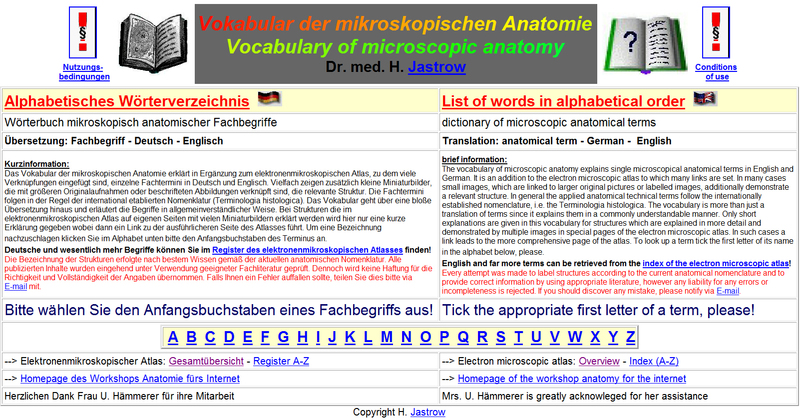 An English index page (Fig.2; lacking in the www-version) allows a direct look-up of over 2,900 English and >4,300 German terms in explaining texts on the pages of the altas. 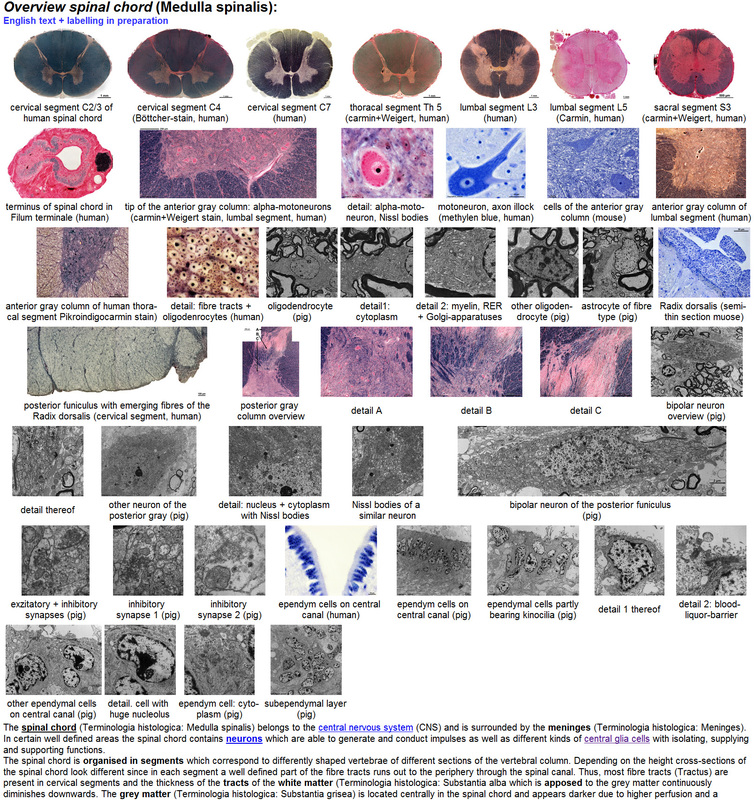 Further links form the index page lead to the main page of the integrated vocabulary of microscopic anatomy offering alphabetical choice of terms (Fig.3, Demo 7), and to pages explaining specimen preparation, to pages with images of transmission and scanning electron microscopes. 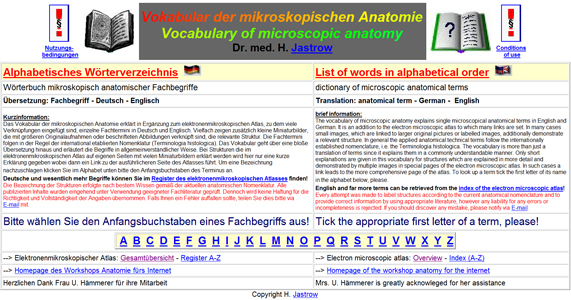 In addition, the overview page of the images provided to the course of microscopic anatomy of the university of Mainz (Germany) and a page listing the abbreviations used for labelling are linked to appropriate texts on the main index page of the atlas. 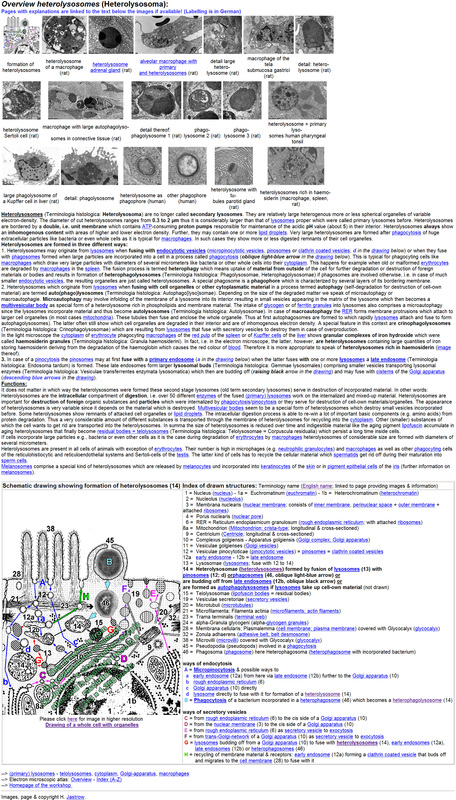 By clicking on "The Cell" a page is called up which shows a schematic drawing of an idealised cell (Fig.4) showing all relevant ultrastructures e.g., organelles and surface specialisations. 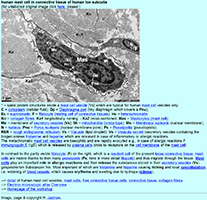 The given names are linked to further overview pages providing appropriate information and image overviews. The German main page further offers a link to most instructive lecture images of cell structures with short key words in German (sample). 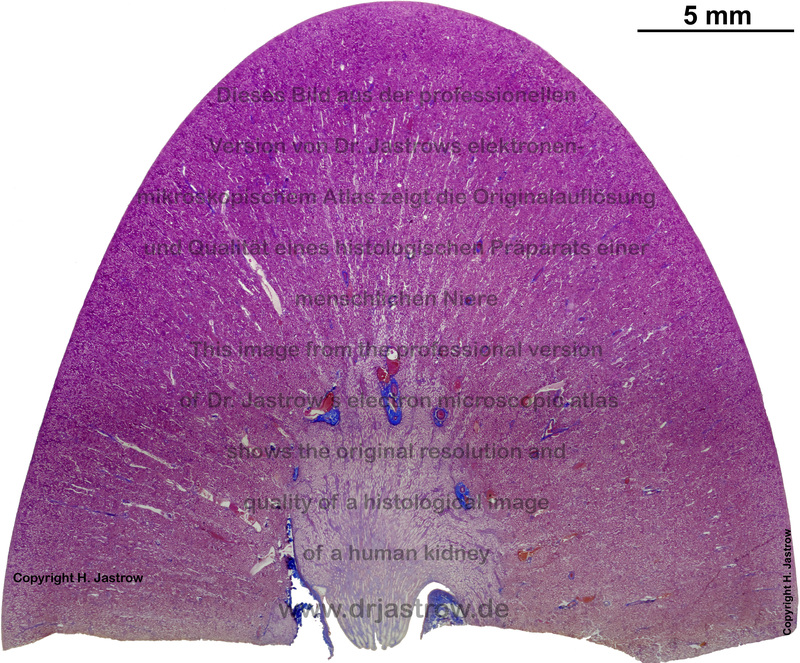 Miniature images with key word-like legends (samples) allow quick retrieval of interesting material. 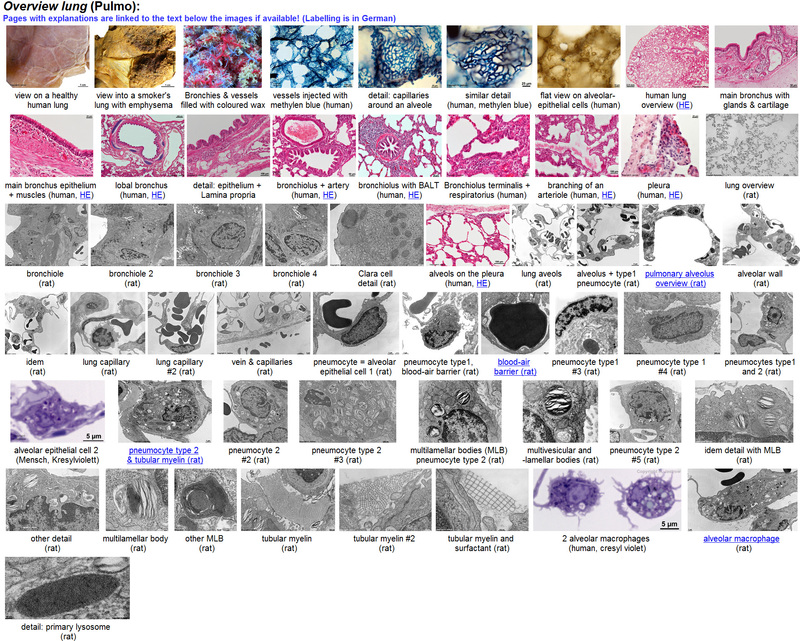 When clicking on an image the appropriate original image is shown as high-resolution image file (samples) providing all available details. 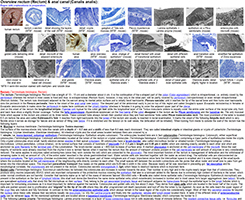 A click on the legend of one of the over 250 labelled images leads to a page explaining the image (samples). 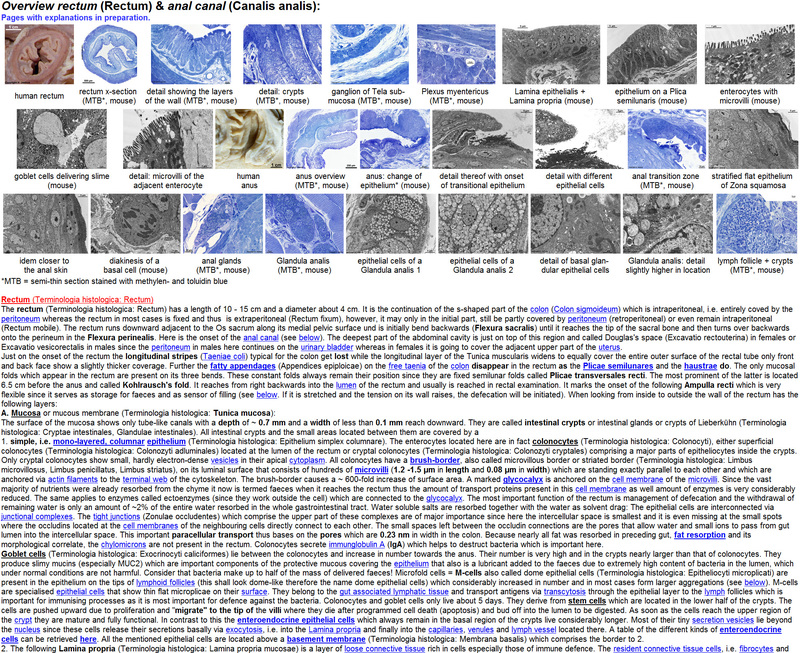 Such pages show the whole image scaled down to a height of 500 pixels for better overview. 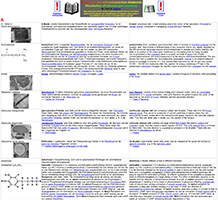 All relevant structures are labelled with uniform abbreviations which are explained in a legend in generally intelligible way (presently in German, English translation in progress, some English pages are already available; samples). 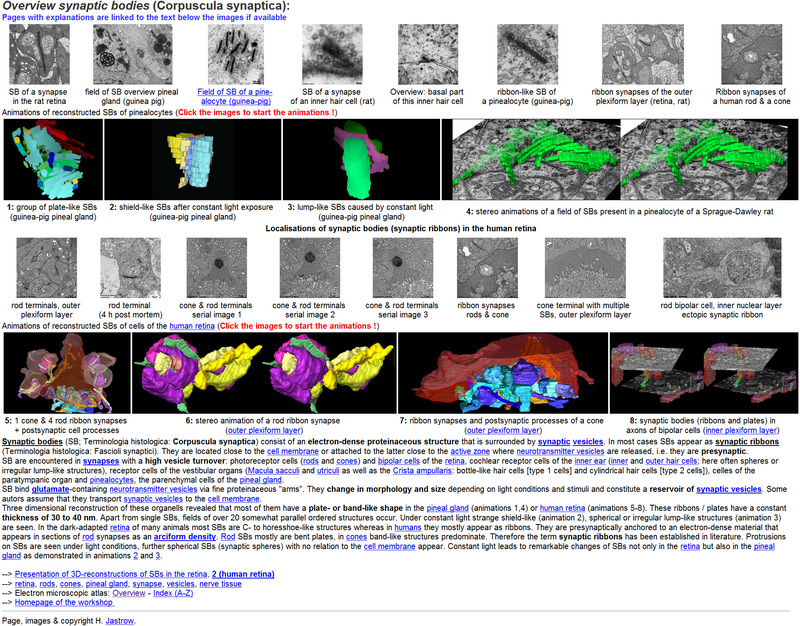 Further the atlas contains a few animations of reconstructions of retinal ribbon synapses and synaptic ribbons (sample). 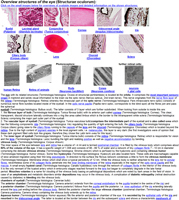 The atlas demonstrates and explains nearly all structures of cells tissues and organs. 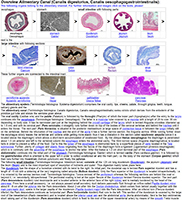 The detailed information is helpful for biology lessons in schools, colleges, high-schools and lectures, courses, seminars and other teaching events in universities. 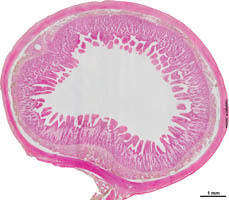 They are very use useful for basic and continued education not only in anatomy but also in all other disciplines of the biomedical research and teaching field, e.g., in pathology, molecular cell biology, biochemistry, pharmacology, physiology, clinical an biological instruction and research. The material is of value for public teaching as well as for individual learning or recapitulation. 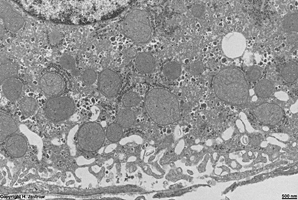 The atlas may be used as reference for "normal" ultrastructure and is a source of images and information for science, research and teaching. 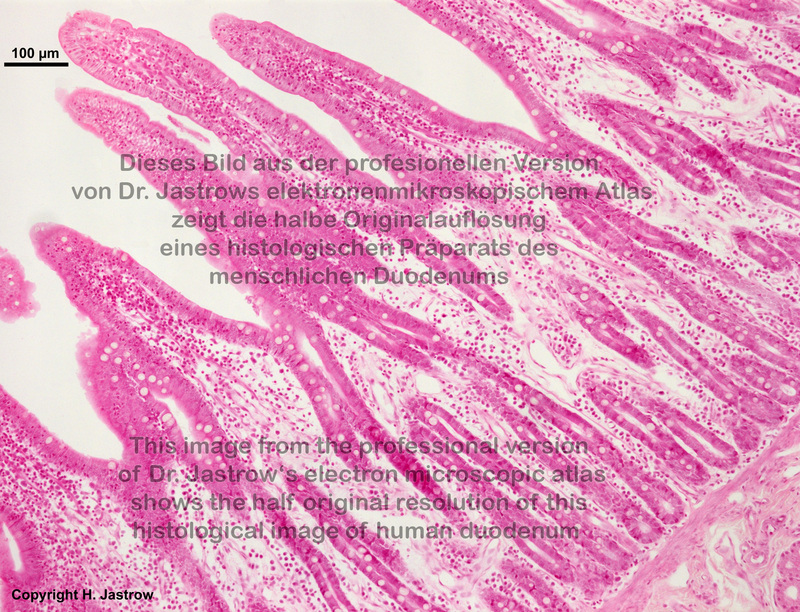 Selected images are used for demonstration and examination in histology courses at some places, e.g., the J. Gutenberg-University (Mainz, Germany). 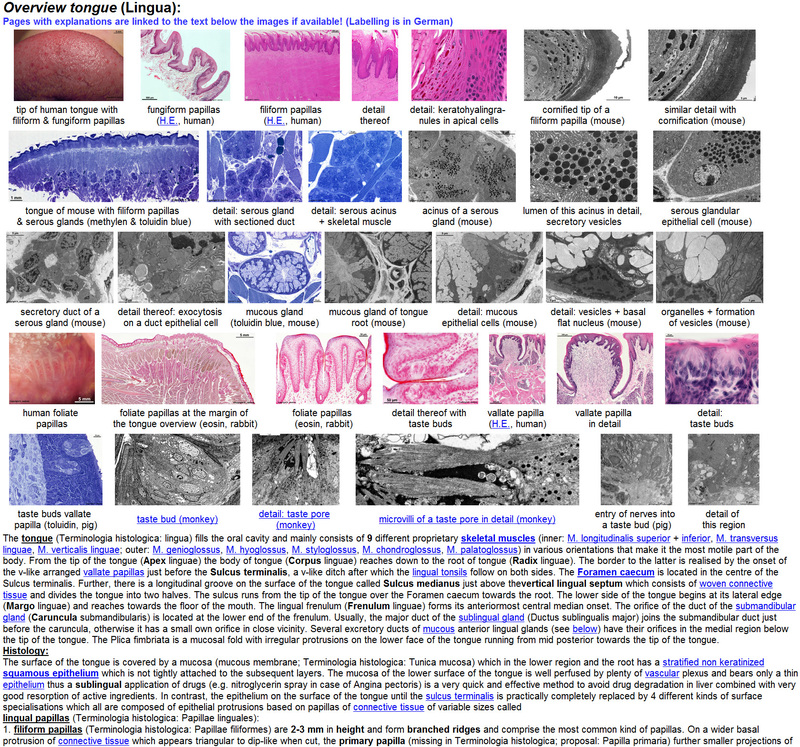 This choice of didactical valuable images is shown on special pages of the atlas. 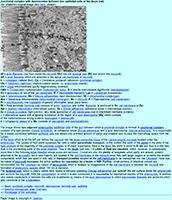 An intranet version installed on a password protected local network easily allows lecturers, employees, teachers and students or pupils of an institution to access the whole material as a source of images for inclusion in presentations, lectures, course or examination materials or as learning materials to understand interrelations of structure and function. 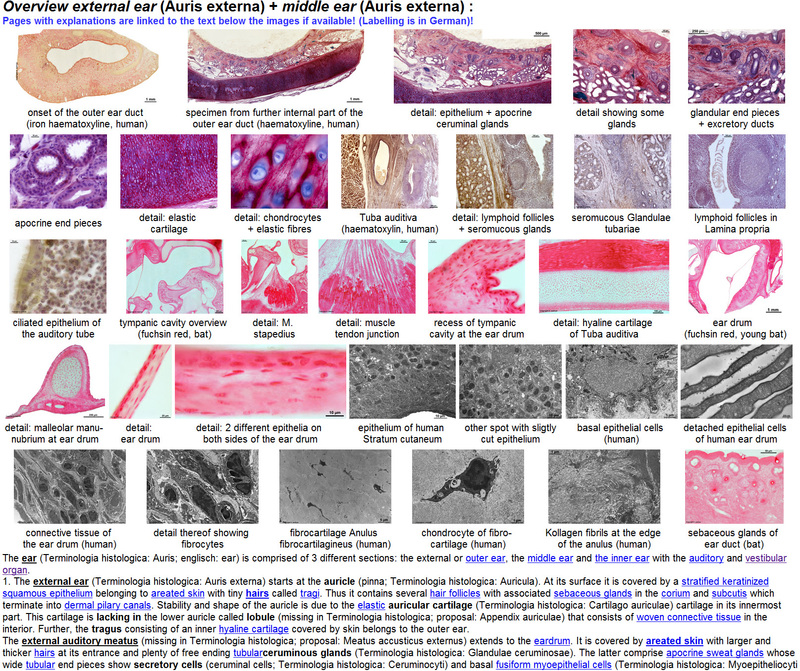 Since anatomical terms and topics are explained in detail in a generally intelligible way the atlas is of value for specialist training, medical, dental and biological instruction, training in medicine associated professions, biology lessons and self-information of lay public. The labelling of structures follows the international nomenclature (Terminologia histologica) and a vast amount of (but not all) pages are available in English which allows an international use of this unique knowledge and image database. 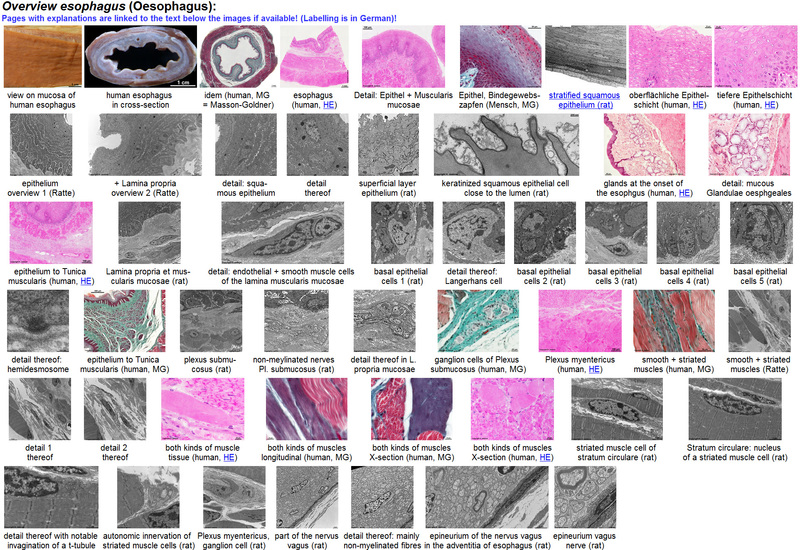 The atlas is internationally used since years by teachers of biology, high-school teachers, lecturers and medical professionals and intranet versions are used in several universities by lecturers, instructors and students. The atlas can also be used as reference of "normal" ultrastructures for comparison with own preparations. 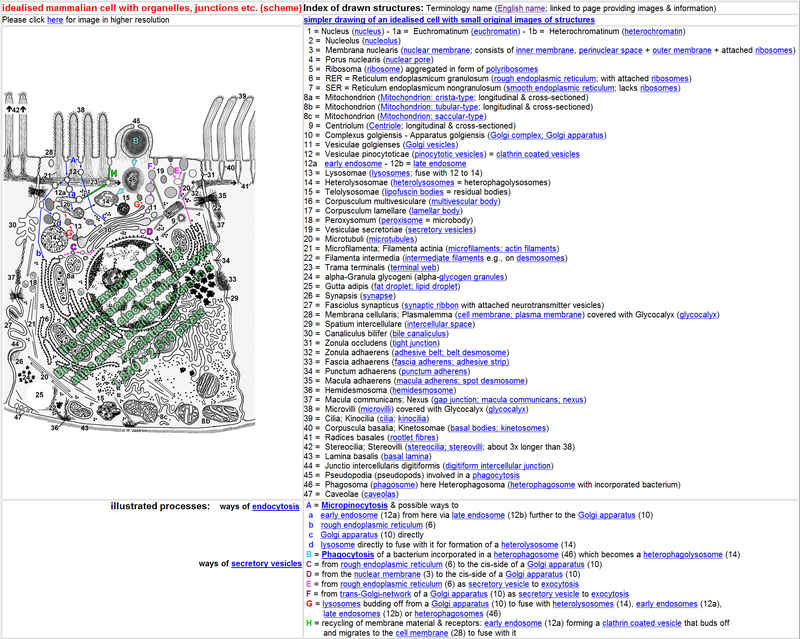 The organization of the atlas allows the user to retrieve the personally relevant information interactively. 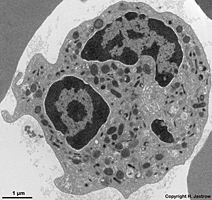 Links from key words or short descriptions lead to image overviews, original images and detailed information about cell organelles in a way that a comprehensive understanding of ultrastructural interrelations is enabled. 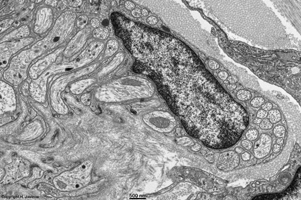 The splendid high resolution original images give a realistic picture of cell and tissue ultrastructures and in case of labelled images allow to check the own skill of knowledge. 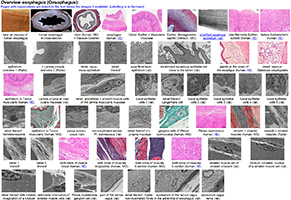 Compared to conventional often unwieldy, expensive and difficult to get comprehensive textbooks this atlas allows to see a great number of images and to get information on a topic easily using interactive link technology. 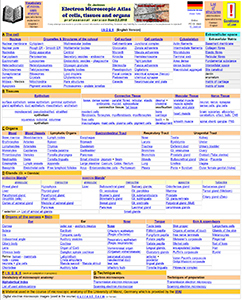 Updates of this atlas which is under constant development and extension can be easily integrated and realise suggestions for improvements by users. 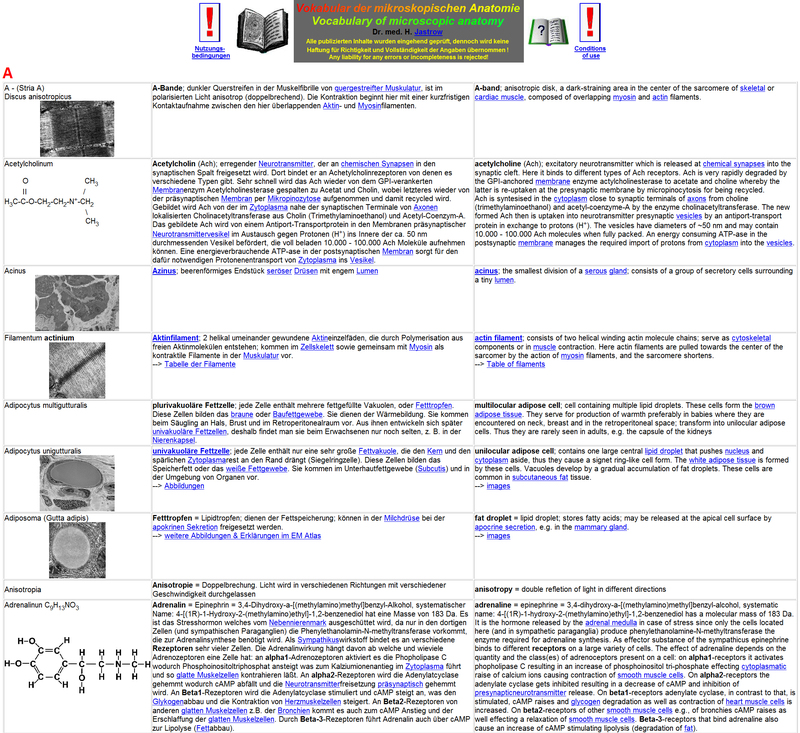 The atlas is a detailed, extensive and easily accessible addition to other instructive material particularly since at present no comparable products are available neither in the internet nor as commercial software. 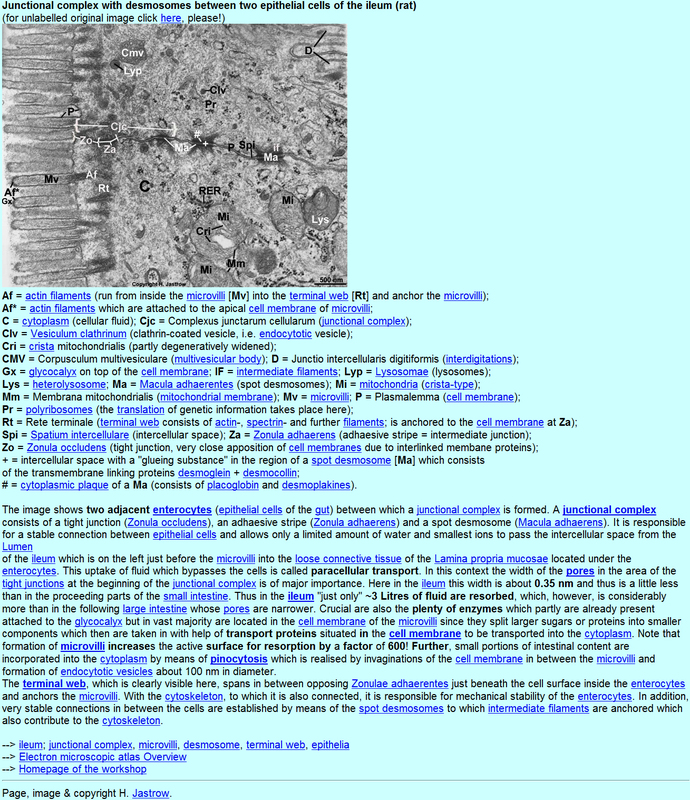 The atlas and the attached vocabulary of microscopic anatomy are constantly extended and reviewed, this includes new images and texts/text additions/corrections/updates. It is planned to label all images in detail and to provide a virtually complete atlas of human and mammalian ultrastructure including all kinds of cells, organs and structures as an international reference base in English and German perhaps in other languages as well. 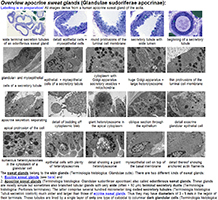 All items, topics and structures shall be explained according to actual knowledge and shall be demonstrated by a variety of different splendid high-resolution original images. 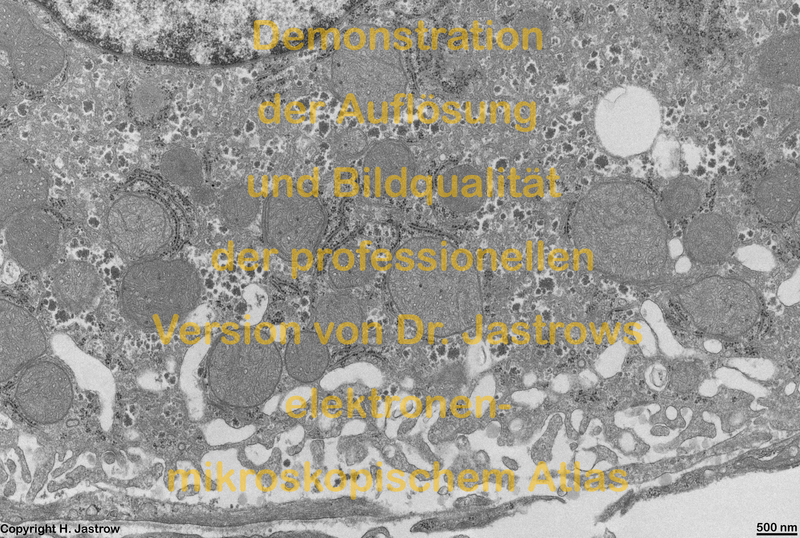 The professional version of Dr. Jastrow's EM-Atlas is a further development of the internet atlas of electron microscopy which was first presented in the "Deutsches Ärzteblatt" (DÄB 98, issue 41B: 2290-2292 [12.10.2001], as well as supplement Praxis Computer 5/2001: 17-20. 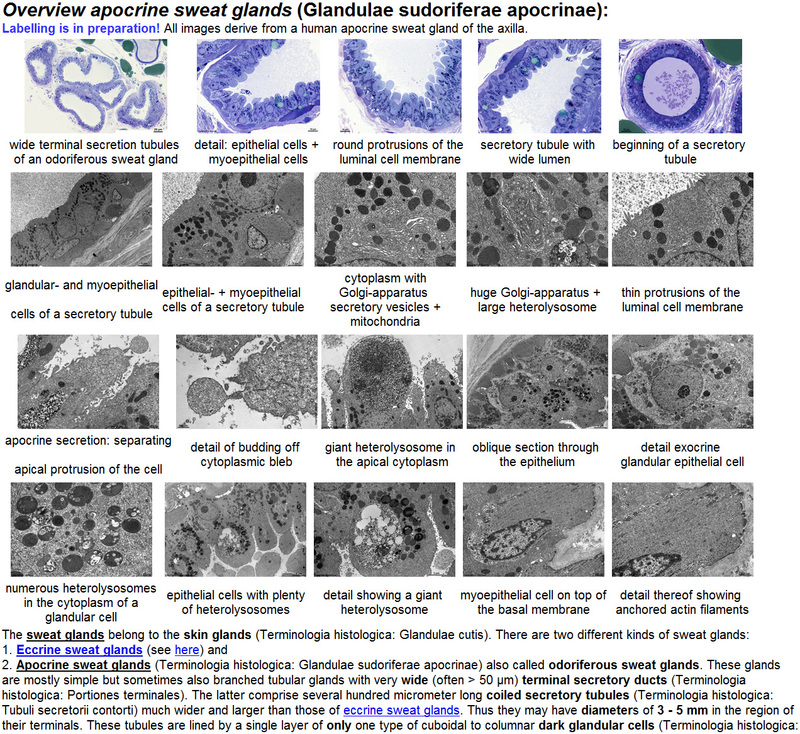 Article in PDF format). 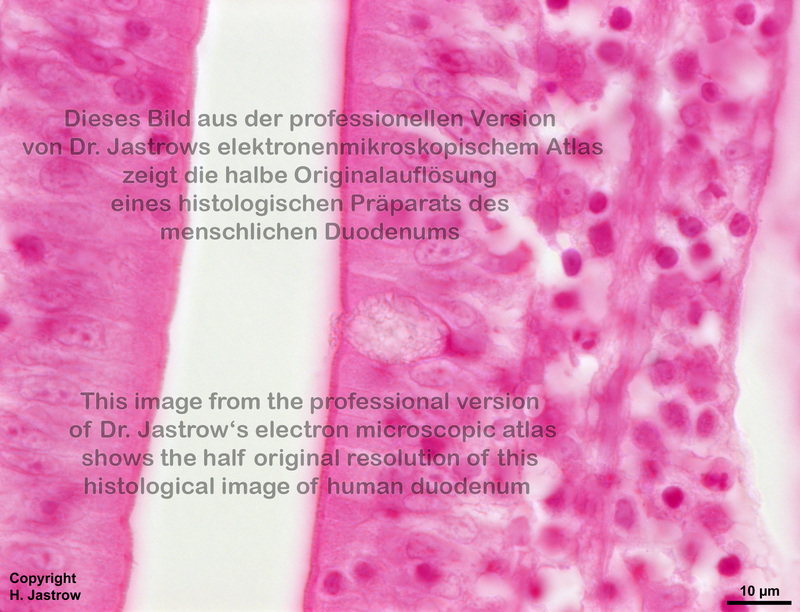 A former version was presented on the 96th meeting of the Anatomical society at Münster on 25 March 2001 (Presentation No. 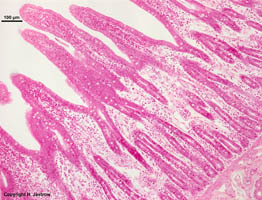 83; Abstract published in Annals of Anatomy 183 (Suppl. ), p. 50-51. 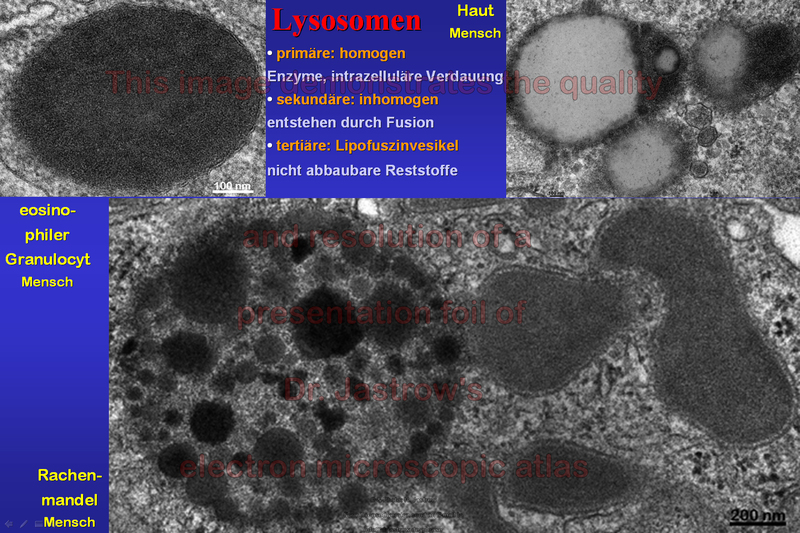 Internet version of this presentation). A considerable number of e-mails and server statistics of the internet version prove a very high interest in this offer. Feedback from lecturers, teachers, students and pupils indicate that the atlas is a very useful and suitable aid for lecture course and exam preparation. 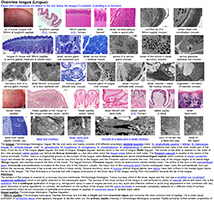 The publication "On the use and value of new media and how medical students assess their effectiveness in learning anatomy" (Anatomical Record B Volume 280B, Issue 1: 20-29 [Sept. 2004]; Abstract & link to pdf) clearly demonstrates student's demand for high quality original image material, comprehensive explaining texts focused on the essentials offering exam relevant knowledge and additional electronic teaching material which is easy to handle. 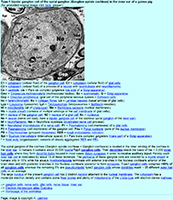 The atlas is provided on 2 DVDs and contains over 7.3 GB of data. After installation on a hard disk drive it may be used with help of any common internet browser software (which is not provided on the media) on IBM® compatible PCs. 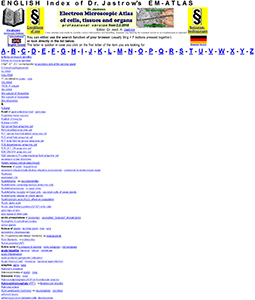 It was tested with Netscape® from Version 4.6, Internet Explorer® from Version 3, Mozilla® from Version 1. 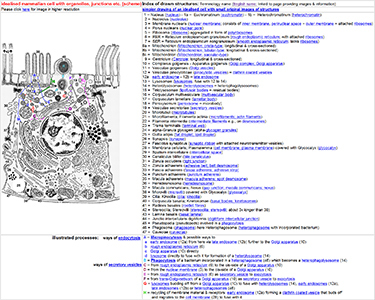 Since the atlas aims to present essentials as fast and easy as possible no complicated java script operations or decorative animations are applied. 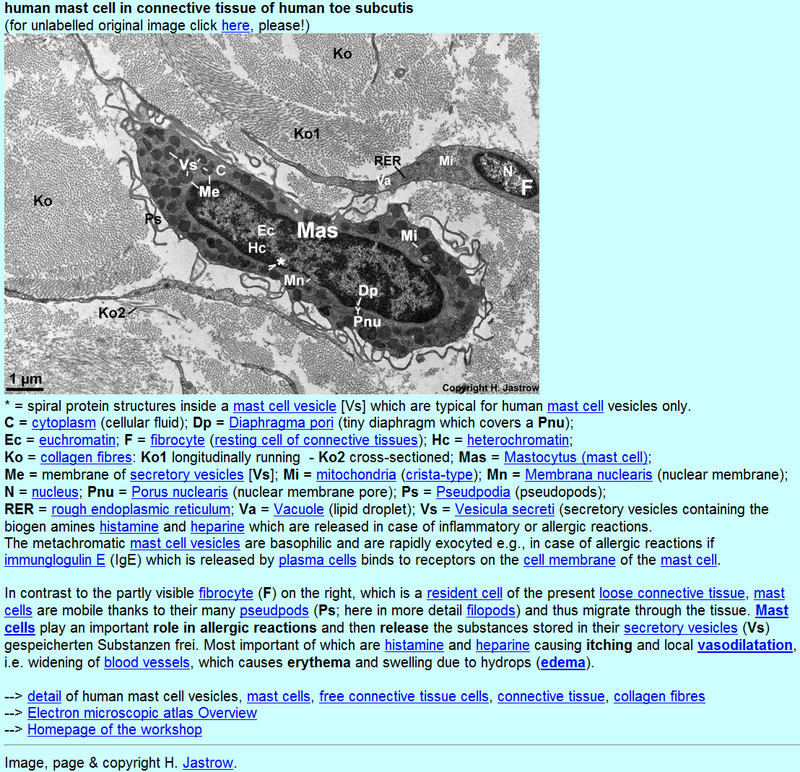 The atlas consists of .html pages, jpg images and a few mp4 coded .avi animations. Thus it is running under Windows® as well as Linux and other operation systems. It was tested on a minimal system with an Intel® 486DX2-66 processor, 128 MB RAM and 20 GB HDD. 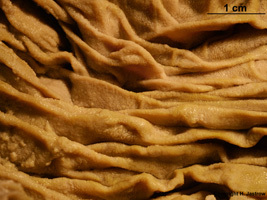 A higher resolution monitor with suitable graphic card offering a resolution of 1,600 x 1,200 pixels is recommended since otherwise only very small parts of the large original images are visible. 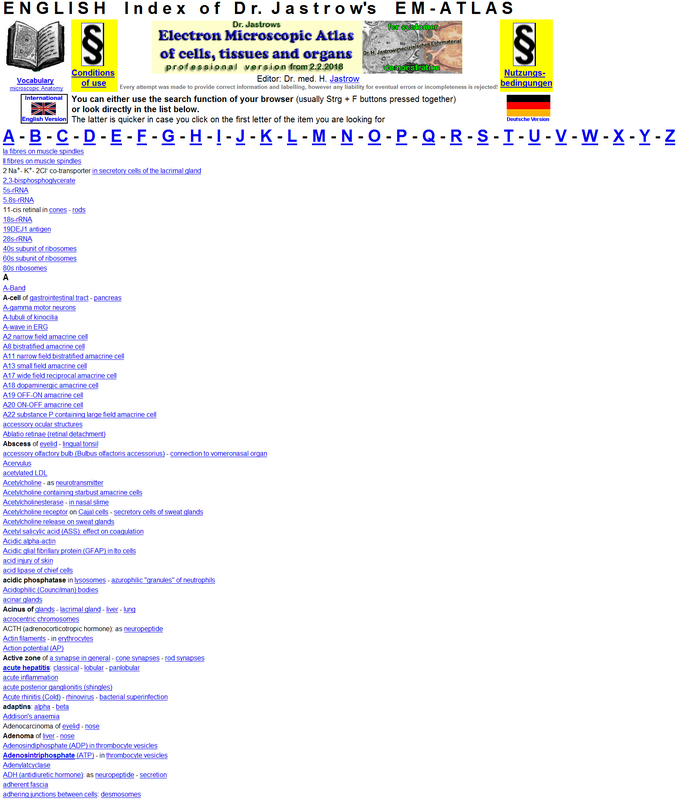 The products and brands marked with ® are trademarks of the legal owners. 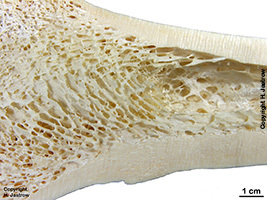 1. single licensed images according to customer's wishes. 2. personal single user license: such a license may exclusively be used by the licensee and ends with his/her death. It allows personal use and use of images in strictly own non-commercial teachings where material is shown but not distributed in any way. No material may be given in any way to others or published in any form. Please inquire via email for an individual price offer. 3. workgroup, departmental, institutional, school, college, high-school, university, practice or other kinds of multiple user licenses allow authorized users in a password protected intranet which may not be accessible by others to use the entire materials. The network is to be administered by a main licensee who is responsible that only authorised users have access to the material. All materials may be used by all members of the licensed unit for any in house non-commercial learning/teaching purposes. Printouts may be made and distributed in "house" used as course materials or integrated in lecture notes. Such licenses are on an annual base, i.e. need to be renewed after each year of use. 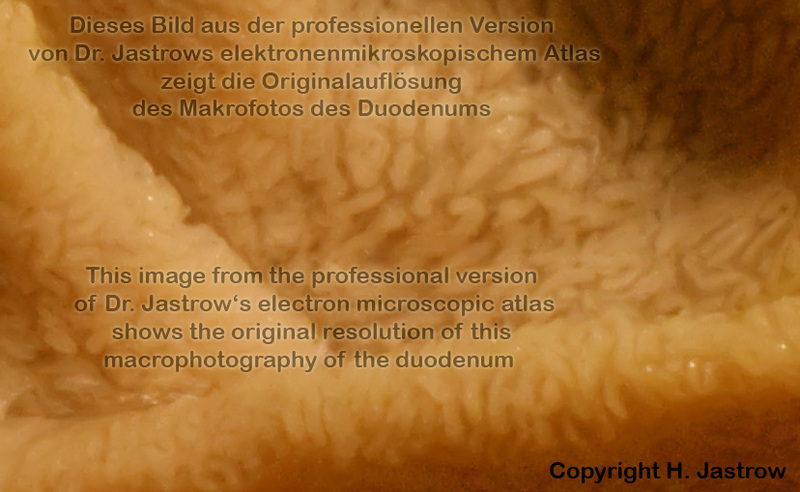 On the occasion of a renewal the customer receives updates to the current version of the atlas. Please inquire via email for an individual price offer which will depend on the number of authorized users. 4. special individual licenses are possible upon request. 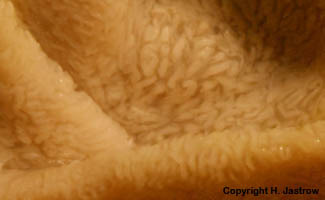 Generally, besides a copyright note, either a personal or an institutional license text will be included in all larger images possibly indicating the end of license. Every customer will receive an individual license agreement as part of contract. 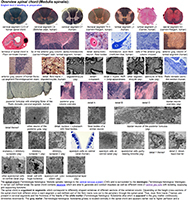 The atlas is published freely accessible in the WWW in a considerably reduced manner (image resolution and quality are very significantly lower, NO index page, NO macrophotographies, NO images from histology). 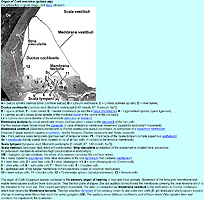 Please note that the www version has NOT been updated since December 2013. 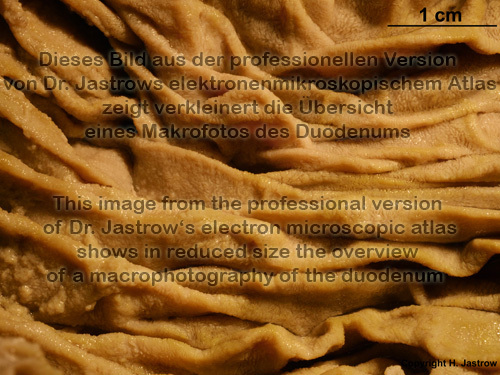 For this reason the presently over 35 new pages (see below) and all updates of the professional version, which is under constant further development, are NOT available online until an entirely new release of the atlas will be finished.